Our expert technicians at 858 Locksmith are the keyless entry lock professionals in San Diego, CA and surrounding areas. We are an established, licensed bonded and insured, complete locksmith service. With our mobile locksmiths we can offer reliable 24/7 locksmith service often with a 30 min response time. Our honest, up front pricing will ensure that you don’t get any surprises when you get the bill. With 5+ years experience, our fast and friendly staff can answer any questions you have about which keyless entry system is right for you. Our team installs and repairs a wide range of of new high tech locks to meet your security needs. Whether you are worried about losing your house keys, need extra security at your business, or would like to easily change the locks on your residential units, a keyless entry lock gives you flexibility, convenience, and peace of mind. 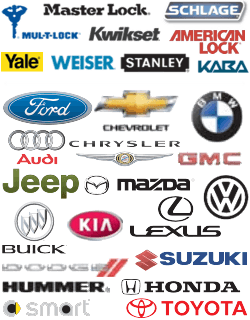 Our technicians offer a large variety of services to install and repair many types of high tech lock systems. Security technology changes rapidly and issues with a security system can cause many problems for your home or business. You need a company that you can depend on to give you the best service from the most knowledgeable individuals in the field for a reasonable price. We make sure that our staff are the best in the business. They stay up to date with the most advanced technology. Here are some of the types of high tech systems that we can install and service. A keypad lock is unlocked by entering a predetermined code. Codes can very easily be changed, added or deleted making them ideal for situations where you want someone to have access to an area for only a certain period of time. You will never have to worry about forgetting to lock your door because these lock automatically. Our locksmith technicians are well equipped to install and service these complex locks. These locks are more secure than other keyless entry locks. To be unlocked, they require some biometric data such as a fingerprint, palm print, or retina scan. They can easily be programmed for multiple users and they lock automatically. If the power fails, these locks have a battery back-up so that you can continue to lock and unlock them even after the power goes out. These very complex mechanisms require maintenance to keep them in good working order. You can trust our team to deal with the installation and repair of your biometric lock systems with confidence and care. 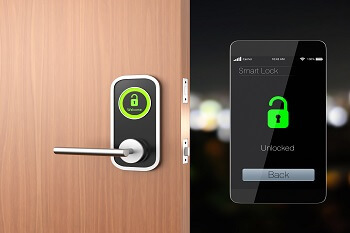 The most flexible high tech lock on the market is the smartphone controlled lock. These mechanisms allow the user to lock and unlock them remotely with a smartphone app. The owner can create a digital key for the lock. Different digital keys can be created for different people allowing the lock owner complete, convenient control over who has access to the area and when they have access. The systems can even keep a log of who enters and leaves the area. We have the high tech equipment and tools that it takes to service and install these locks. We also have reliable, knowledgable technicians who understand how these sensitive systems work. Our knowledge of electronic locks does not stop there. From time sensitive locks to card reader locks, we have the expert technicians to repair, replace or install a keyless entry lock for your home or business. If you are having trouble with your locks call us right now. 858 Locksmith will provide you with reliable affordable service for any high tech lock. It’s simple really. We can provide you with local, honest, professional service competitively priced. In San Diego, CA and surrounding areas you will not find another locksmith business that offers complete locksmith services with up front pricing that you can trust. We offer you 24/7 locksmith service that gives you the peace of mind that your home or business can be secured quickly and economically. Call us today. Keyless Entry Locks https://858locksmith.com/keyless-entry-locks/ 3.3/5 based upon 10 reviews.